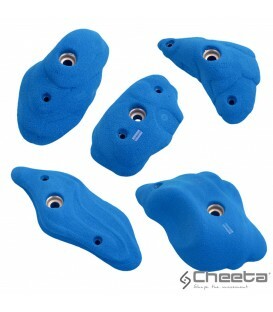 Swiss quality polyurethane screw-on climbing holds. Thirty crimpy screw-on footholds in various shapes from polyurethane. Useful for expert climbers! They are for fixing on flat plywood. Screws are not included in set. One big sloper shaped by Rober Leistner. Fastened with capheaded or countersunk bolts M10 x 150 (dual system) and screws. Bolts are not included. Warning: Bolt M10 x 150! Five holds. Slopers for bouldering, it can also be used on the volumes.. Fastened with capheaded or countersunk bolts M10 (dual system) and screws. Bolts are not included. Five holds. 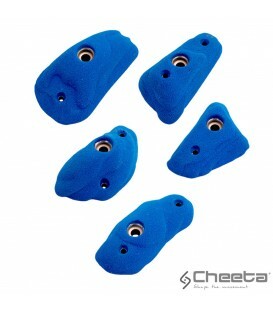 These holds can be used for bouldering or can be fixed on volumes.It can also be used in hard routes. The prehensions are various, flat, pinch, edge... Fastened with capheaded or countersunk bolts M10 (dual system) and screws. Bolts are not included.